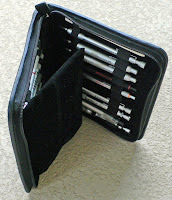 Bob from Florida recently sent in a few photos of his Rosetta 20-pen case. As you can see it’s very well stocked, a case to be reckoned with. Bob’s only problem is that his wife and other ‘artistic’ relatives keep taking a liking to the contents, and frequent replenishment expeditions are required. He’s not entirely sure whether he should be thanking me or blaming me for all the money he’s spent on pencils…he's going to decide when he’s spent some more. 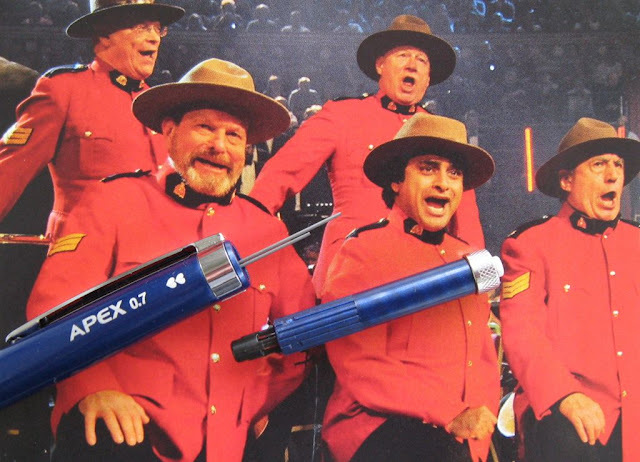 The Papermate Apex mechanical pencil has a got a lot going for it. Firstly, and perhaps most importantly, it is a member of that fairly exclusive club, the ‘Vanishing Points’. I’ve come to the conclusion that vanishing point mechanism pencils don’t actually get much press. Well, certainly not the press that I think they deserve. 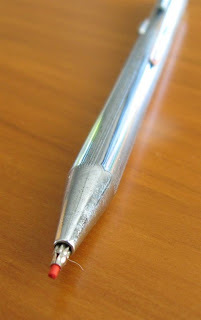 The Papermate website describes the Apex mechanism as “retractable”. That’s it. One word. One single word to ambiguously describe what is surely the primary marketing feature of the product? A sliding sleeve is retractable too, but that’s not the type of retractability we are talking about here. One problem I do have with vanishing point mechanisms is that many of them are designed so that when retracted the end of the lead sleeve is only just inside the barrel, and you can easily end up with lead sticking out past the end of the barrel. 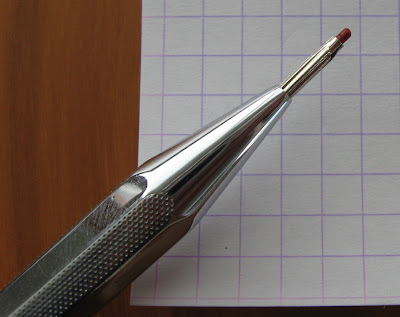 A problem that some folk have with vanishing point mechanical pencils is that the retractable tip introduces another possible source of lead wobble. The amount of lead wobble you can tolerate obviously depends on your personal requirements. I generally don’t have too many problems with the amount of wobble on vanishing points, and the Papermate Apex is no exception, but there is of course more wobble than on a good quality rigid sliding sleeve or fixed sleeve pencil. In the hand the Apex is a medium weight pencil and a little top heavy. Well it feels a little top heavy, no doubt thanks to the twist out eraser cartridge, but objective measurement of the balance point doesn’t entirely back me up. The grip is a dimpled rubber piece. The compound is quite hard and doesn’t really move under finger pressure, but at least the compound is reasonably grippy. 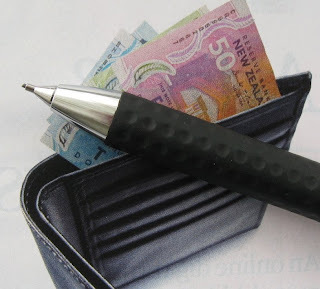 The pocket clip is strong chromed steel, quite springy, with ‘Papermate’ and ‘Japan’ stamped into it. The only other markings on the mechanical pencil are ‘Apex’, the lead diameter and the Papermate double-hearts printed on the barrel. Up at the top end of the pencil we have a twist out eraser. The top of the twist out cartridge has a knurled chromed ring which adds a touch of class to the whole thing. The eraser is one of the thin diameter types, with the eraser core being just under 4mm diameter and having about 28mm of usable length. The eraser cartridge is also the push top button that activates the lead advance mechanism. Whilst one big click will extend or retract the vanishing point mechanism, ten more modest clicks will get you 6mm of 0.7mm lead. You pull the whole eraser cartridge out of the main body to access the lead refill chamber underneath. Overall then I’m pretty positive about the Papermate Apex, but somehow this pencil just doesn’t grab me, to me it just doesn’t look right. It’s the grip. The Apex has got some great features like the vanishing point mechanism and the twist out eraser, and it’s a good pencil, but for me, the grip…it’s just such a negative. Obviously many will disagree, but visual styling is a matter of personal taste and that matt black grip as part of a long straight otherwise glossy and metallic barrel…it just doesn’t fit. Maybe if the grip was a different diameter to the body, or contoured, but as just a long matt black dimpled continuation of the line of the barrel, it’s just doesn’t look good to me. Sorry. 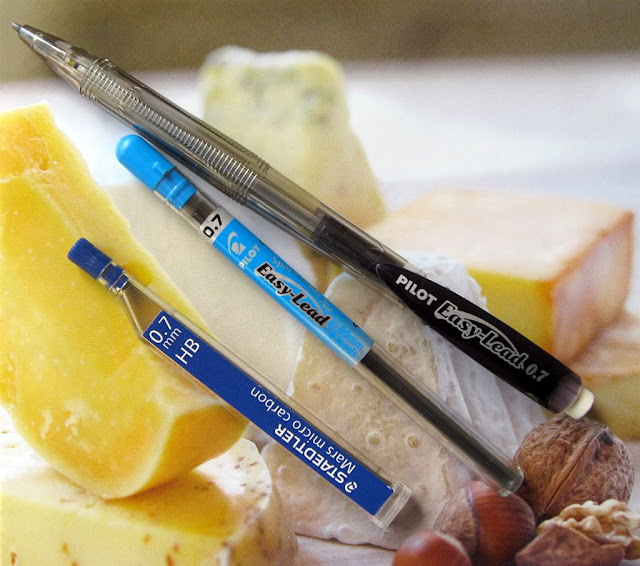 Anyway, I don’t want to end this review on a negative, so I’ll be positive - if you like the look of the Papermate Apex mechanical pencil, then buy it. • Best Points – Vanishing point mechanism. 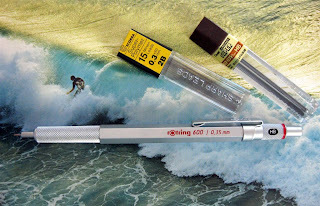 • Not So Good Points – For me, the grip just spoils the whole aesthetic look of the pencil. Dimensions – Length 136mm, diameter 9mm. Balance point about 65mm up from the tip. I recently received a package of leads from someone who reads this blog, an anonymous benefactor from Eugene, Oregon. The leads were surplus to their requirements, and they thought I might put them to better use. Well, I’ll try my best. 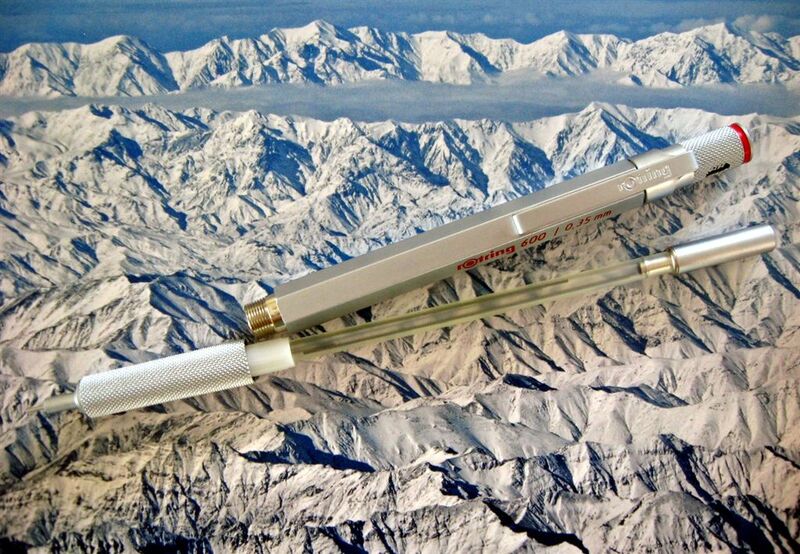 In further discussion with the donor, Pilot Easy-Lead leads came up, and I mentioned I had some from yonks ago but had never used them. My anonymous lead-friend was quite interested in learning more about the Easy-Lead leads as they had heard they were extremely dark, and they were on the look out for the darkest leads around. So, to return the favour, here’s a little something on Pilot Easy-Lead leads. Firstly, the leads are made to refill the Pilot Easy-Lead mechanical pencil, and you have no options with Easy-Lead leads. They are 0.7mm diameter, 90mm long and there is only one (unidentified) hardness grade. Right, let’s lay some graphite on the paper. Yep, those Easy-Leads are smooth, really smooth. And dark, really dark. 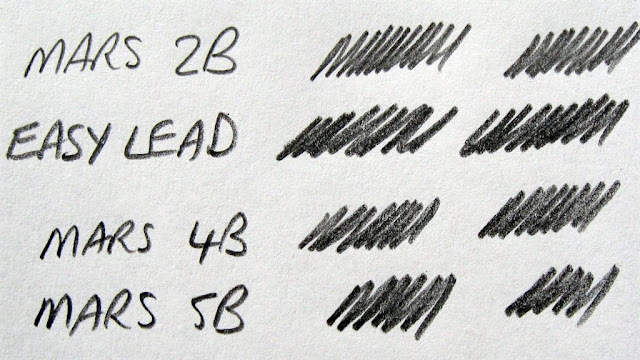 This image shows Pilot Easy-Lead in comparison to the HB grade of three other common brands. There is a world of difference in the smoothness of the writing experience. The photo doesn’t really do a great job of showing the difference in darkness. Sorry about that. Next we have Easy-Lead versus the darkest mechanical pencil lead I have, the Uni NanoDia 4B in 0.5mm. They are fairly similar but Easy-Lead is a little darker and a little smoother. Finally then I thought I’d check out Easy-Lead against Staedtler Mars Lumograph wooden pencils. 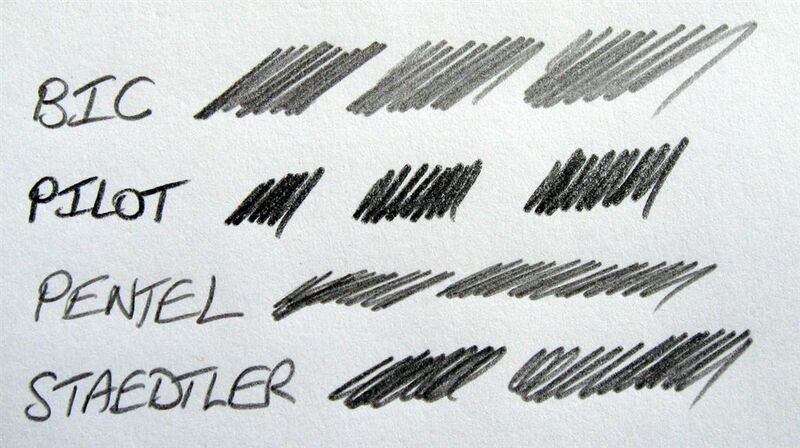 So, I think the Easy-Lead is about the same darkness as Staedtler Mars Lumograph 5B. Easy-Lead still beats Mars 4B and 5B for smoothness though. Clearly then, when it comes to leads, if you are a ‘the darker the better’ sort of person then check out Pilot Easy-Lead leads. Here's what Pilot have to say about Easy-Lead leads. The Pilot UK website says, “Very smooth, dark and dense writing from an extra long 90mm length lead.” I agree entirely. The Pilot Europe website says, “The high density texture of the lead offers a writing quality similar to a gel ink pen.” Yeah, right! Where would a guy like me get a gel pen from? Oh, ummm, well somehow a gel pen ended up by the telephone…hey I didn’t bring it into the house…had to write down a message…the shame of it all. 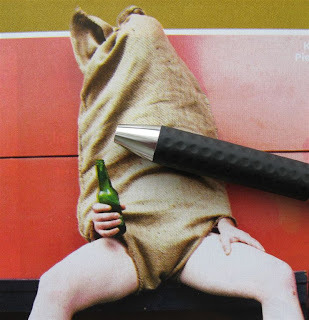 But at least it was a Pentel. Thus from limited experience I think the gel pen comparison might be stretching things a little too far. But maybe not that far. Note: It was years ago, but my Pilot Easy-Lead mechanical pencil and Easy-Lead refill were given to me by Cult Pens in the UK. I promised to acknowledge them if I put them on the blog...been a long time waiting. 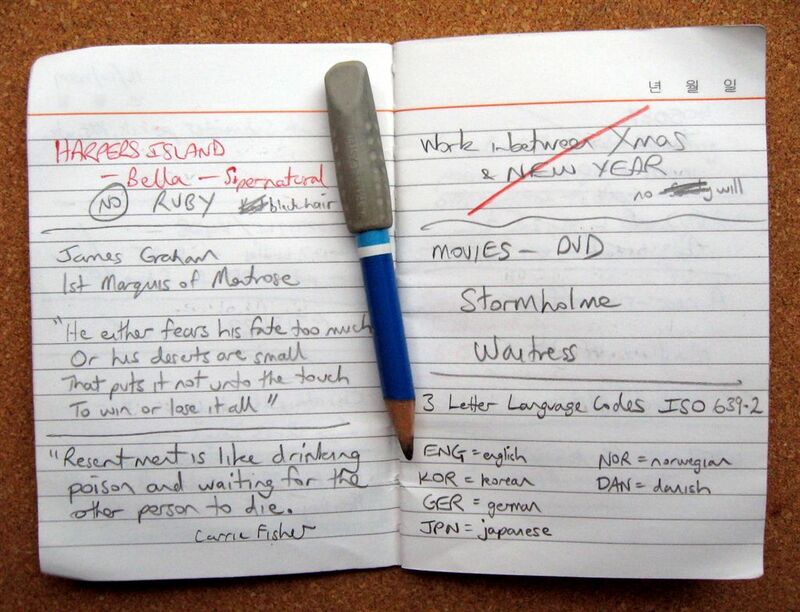 Arne, our man up over in Hamburg, hometown of Rotring and Montblanc, has left a comment or two on this blog, and knowing that I like my leads, he recently sent me a couple of containers of uncommon leads. 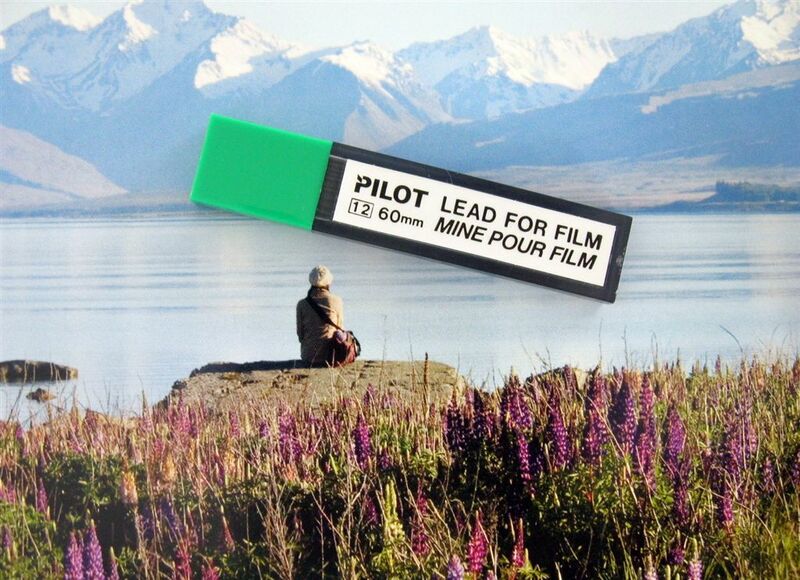 First is a container of Pilot ‘Lead For Film’. I’ve never done any film work so don’t mistake me for someone who really knows what they are talking about, but along with paper, polyester (aka mylar) film was a common draughting substrate. Clear film is dimensionally stable and tear resistant, allows multiple erasings and revisions, and of course allows you to make overlays and you can draw on both sides to enhance artistic effects. Compared to paper it also has better archival and copy-reproduction properties. You can use ordinary lead to draw on film, and many brands claim their leads are suitable for ‘paper and film’ but these special film leads are optimised for drawing on polyester film rather than on paper. I don’t imagine they are big sellers, but for example Pentel USA still offer them, with hardness grades soft, medium and hard, rather than the usual HB scale. For a quick comparison, I did a bit of scribbling with the Pilot Lead For Film 0.7mm grade H and with Staedtler grade H ‘ordinary’ leads. The film leads really are significantly harder and lighter than Staedtler 'ordinary leads' grade H, so perhaps a film lead H (for Hard) is more like a 3H in ordinary leads. Right then, moving on, second in the parcel from Hamburg were some 0.3mm leads that are new to me. 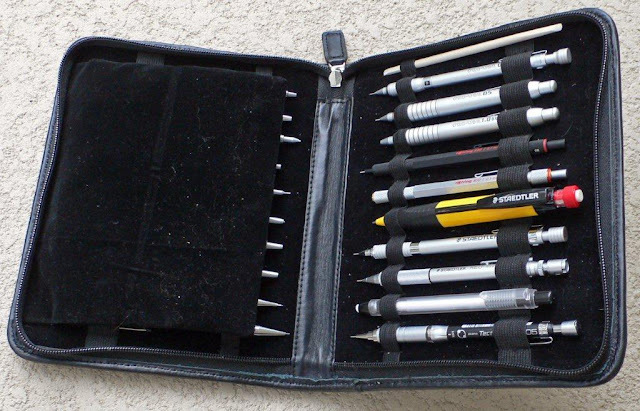 Ecobra is a German brand of compasses and other such drawing supplies. Now, the name Ecobra is an acronym and I don’t know how to pronounce it. For example is it 'short syllable – long syllable', evoking imagery of turbans, hypnotic flute music and venomous snakes, or is it 'two equal length syllables', producing mental pictures of environmentally friendly 100% organic cotton supportive undergarments. Either way, here’s Ecobra's current lead offering. Apparently they haven’t offered 2B 0.3mm for 10+ years, so these containers are old Hamburgian treasure hoard. The Ecobra lead containers look like generic Japanese ‘Sharp Leads’ so I imagine these leads are probably re-labelled standard production from some Japanese lead manufacturer. Arne also most generously sent a 0.3mm pencil to help test drive these leads. Now, before I took them for a quick spin around the block, here’s what I expected to write, “As you might expect with such thin leads in grade 2B they write dark and they wear down quickly.” In reality though I didn’t find them that much different from my Pentel Super Hi-Polymer 0.3mm HB, although you should bear in mind that I am an inexperienced user of 0.3mm leads. Certainly they were darker, although at times it wasn’t as obvious as it appears below. Strength wise they were a little weaker than Pentel HB, but again it was a rather limited difference. As for wear, yet again less of a difference than I expected so whilst I would say the Ecobra 2B wore down faster, there wasn’t that much in it. Whilst conducting this test I encountered a rather unusual problem. 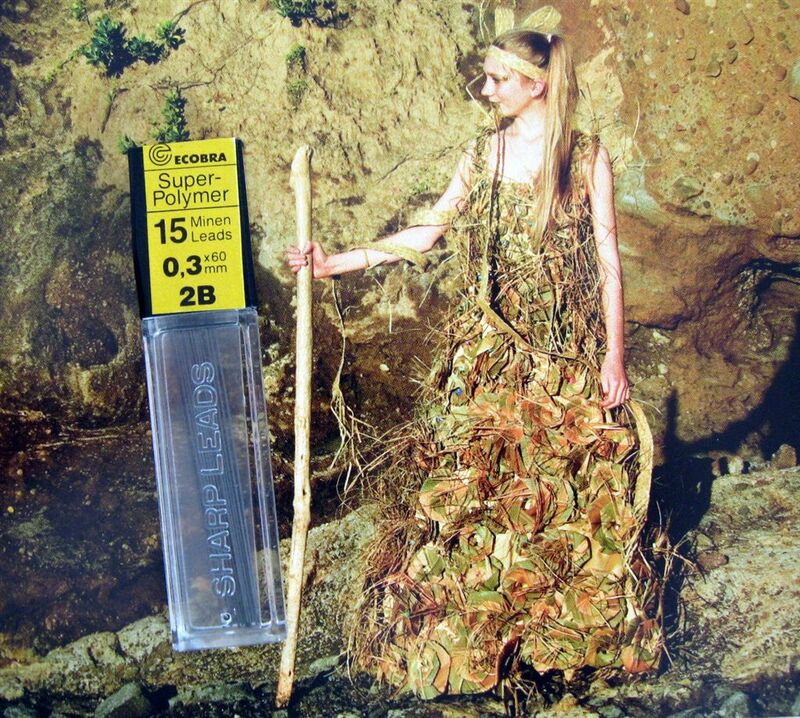 The Rotring 600 would not feed new leads through from the lead storage magazine. I clicked and clicked, stuck more leads in, shook things around, clicked and clicked, all to no avail. I then decided on the (for me) radical course of disassembly, and immediately discovered the cause of the problem. All the leads were stuck to the walls of the plastic lead refill magazine by static electricity. I haven’t ever had this problem before. I’m under the impression that the manufacturers put an anti-static additive in the plastic of the refill tubes to eliminate this problem. Maybe this batch of plastic tubing got under-dosed, or Hamburg static multiplies many-fold when transported down under? Well I walked around the house sticking the plastic tube on all the bits of metal I thought might be grounded and it did seem to help, the leads became less inclined to stick to the walls, and with a bit of effort and shaking I could get new ones to feed through into the mechanism. Anyone else ever encountered this sort of problem? Are the extra light 0.3mm sticks of lead more prone to this than heavier thicker sticks? 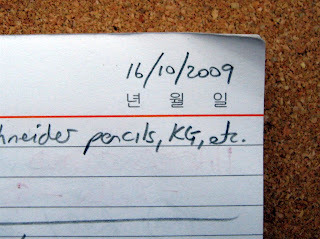 As if PAS (Pencil Acquisition Syndrome) wasn’t enough, I think I also have NID (Notebook Inferiority Disorder). You see, whilst I want to write profound important stuff in fancy journals, they intimidate me. 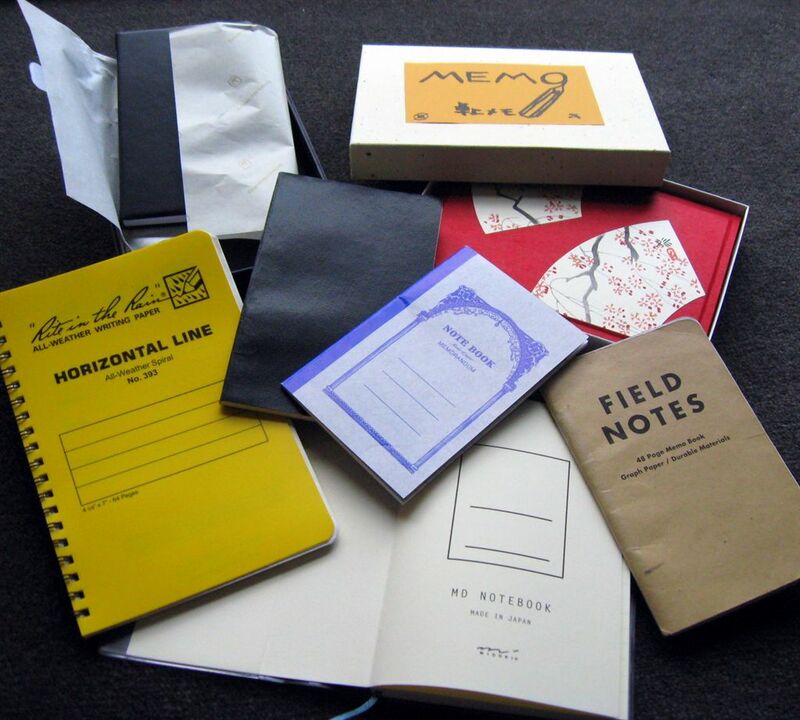 My drivel isn’t worthy of a magnificent Moleskine, a resplendent Rhodia or a classic Clairefontaine. Something simpler and workman like…a Field Notes or Rite In The Rain, that’s more my line. I feel a little more comfortable writing shopping lists, reminders and other such mundane stuff in those sort of utilitarian notebooks. But even so, they are still somewhat superior products and NID is always there…on the fringes…waiting. 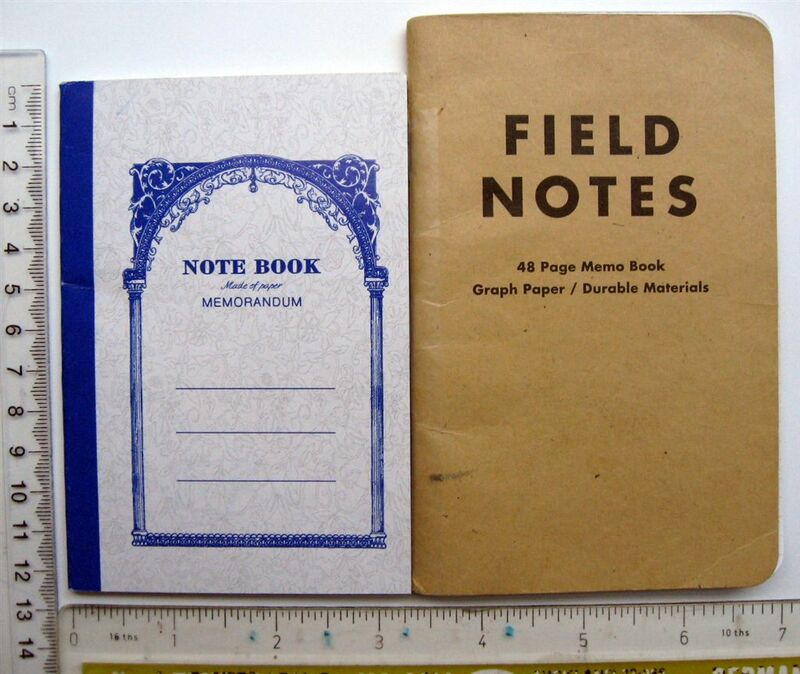 Ages ago Kent from PenciLog was reading my, and other reviews of Field Notes and he recalled the simple common Korean notebooks used in yesteryear, that are now rather unfashionable but still reasonably commonly available, and he decided to send me a couple. 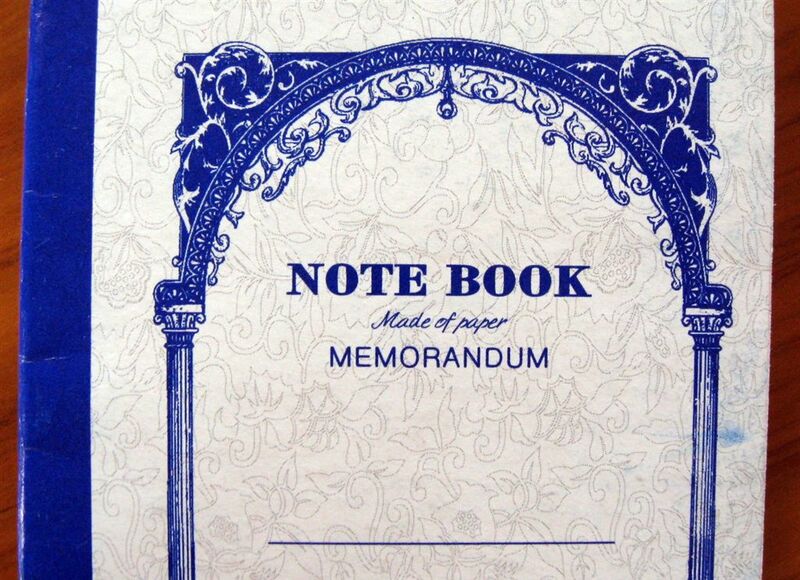 I will keep this review pretty brief because these are basic no nonsense simple notebooks. The brand Kent sent me was Keun Young. 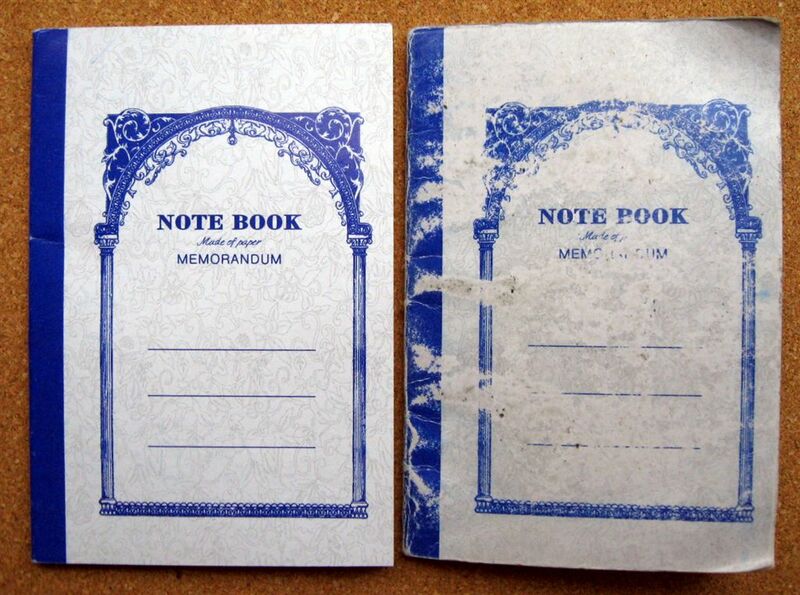 The notebook is the perfect size for me because it fits easily into my pants pockets. At 124mm (5 in.) x 84mm (3 ¼ in.) it is just that fraction smaller than the many pocket notebooks that I always find just a little too big. Maybe I have small pockets? I don’t know. There are 26 un-numbered pages. Top right of each outer corner is day-month-year (I think). The notebook can be opened and laid-flat. The pages are stitched together, but then glued to the cardboard cover. The stitches do not go through the cover so this means the back page has a small thin strip glued down its centre so it doesn’t open quite right. But that’s a minor point. Only the back page is affected – all the other pages open properly. The pages are lined. The paper is “normal” as far as a philistine like me can tell. It works fine with pencil, coloured pencil and ballpoint. Heavy use of a highlighter will bleed through, as will marker pens. I imagine FP ink would too. Personally the cover design looks basic, old fashioned, economy-grade and "Asian" to my western eyes, but then western eyes are not the target market. 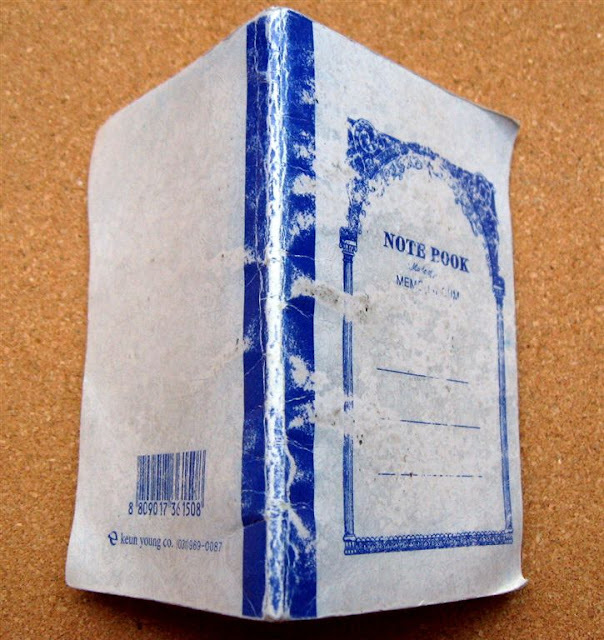 This notebook has lived in my pockets for a little under 6 months, so you know how much I actually write in it. The cover has taken some abrasion damage, and has some dog-ears, but it has stood up remarkably well. The pages are still solidly attached to the cover and the notebook looks like it could survive another 6 months of life in the pocket. It's far to say I had rather low expectations of this notebook, expecting it to fall apart, tear, etc but I have ended up being impressed. In Korea it sells for about 300 Won (27 cents US) i.e. next to nothing. 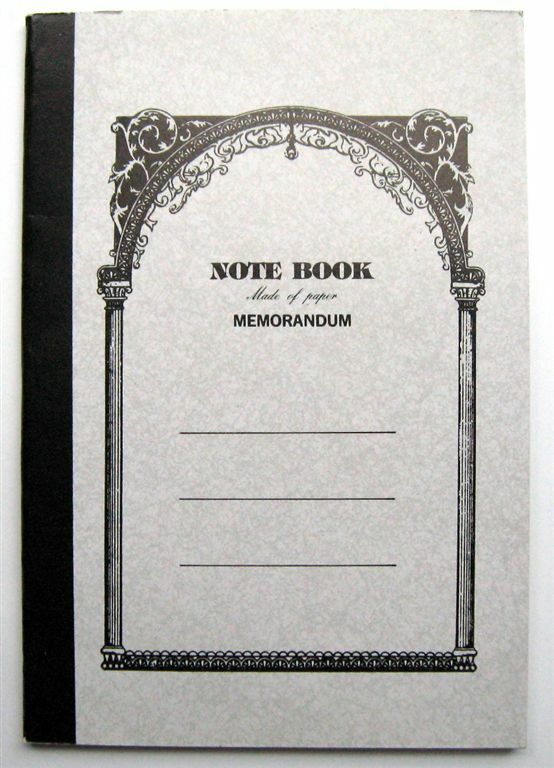 It is a sturdy and durable notebook, and a good size for your pocket. If they got a cover design more appealing to my eyes, offered unlined and (my personal choice) graph squared options then as far as I'm concerned they would be onto a real winner . Here’s another one. Exactly the same, only different colour scheme and different brand name on the back. So, I guess one printing works – many brands. 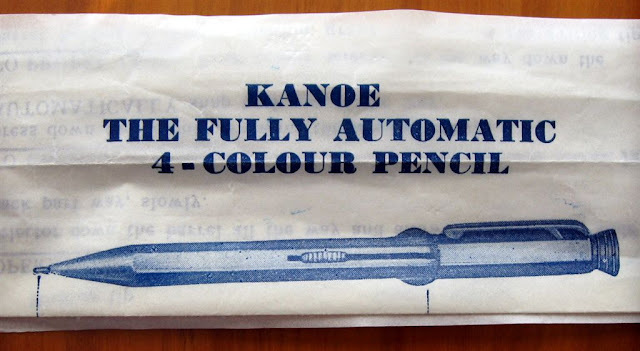 Here’s two vintage Kanoe multi colour pencils that I have. Kanoe was a Japanese company, now long gone, and I don’t know much about them. I have found some information indicating Kanoe was a brand of the Morita Seisakusho company and they exported primarily in the decades prior to and after World War 2. I can only assume they must have exported quite a lot because although they are not common down in my part of the globe, you don’t have to look too long or hard to find a Kanoe. They seem to be quite well made and most are still generally in good condition. First then the lower of the two multi-pencils shown above – it’s a two colour round bodied model. The clip is marked “PAT” “KANOE” and “JAPAN”. You slide the appropriate slider button down to extend the colour tip of your choice – red or black. Black is of course just ordinary graphite. 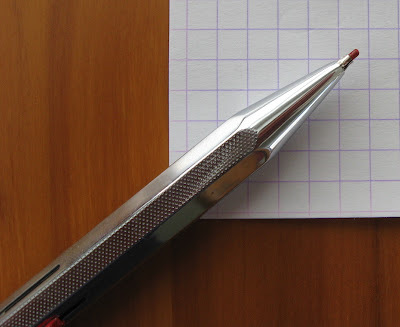 The other model is a four-colour octagonal bodied multi pencil. The clip is marked “PAT” “KANOE / PEACE”. 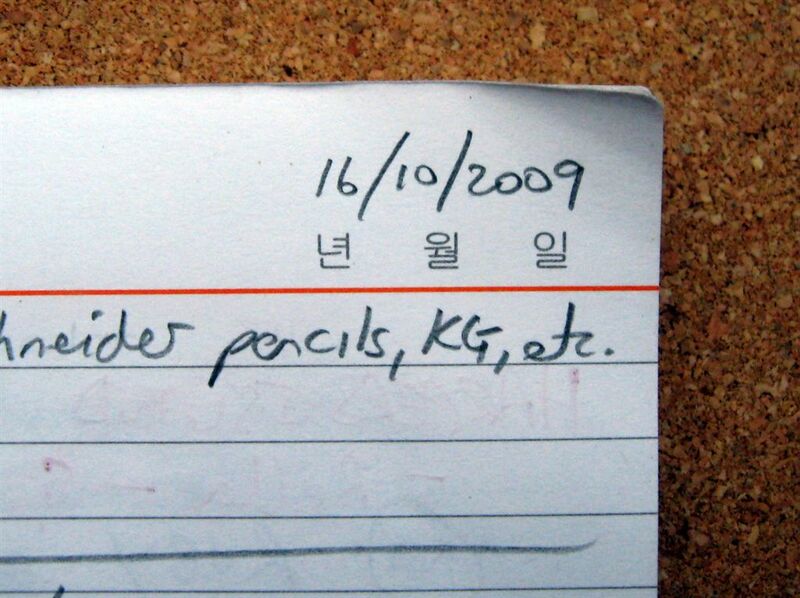 I have noted some pencils to be marked with and without the word Peace and wonder if that might date them to prior / post war? The colours are red, green, blue and black (graphite). The leads are all 1.18mm, same as the two colour model. 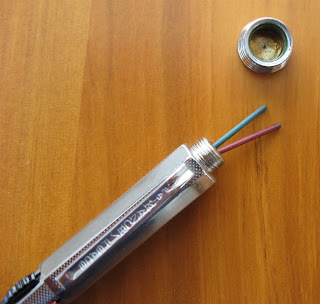 Spare leads are housed beneath the top cap. Having selected the tip of your choice, to actually advance more lead you push the slider down even further to push the tip further out of the body and then you rotate the tip to wind more lead out. It’s a one way system – once wound out the lead cannot be wound back in. I have read some statements that the bodies are mirror polished stainless steel, but I figure both of mine are plated brass. I imagine that when most collectors of anything start thinking about the origins of their collection they immediately focus on the manufacturer - be that a factory, an artisan or an artist. For most collectables there is an intermediary - a distribution and retail system - between the manufacturer and the collector. For me, as a collector of mechanical pencils, it would be pretty hard to collect pencils without distributors and retailers bringing the manufacturers products to market. Recently I started thinking about these retailers, the somewhat overlooked (and sometimes maligned) part of the collecting process. When I first started this blog, I soon established contact with Michael, a blogger in the UK who was keen on writing instruments. Later on he got something of a dream job, a job working in the writing instruments industry, for the UK domiciled online retailer Cult Pens. 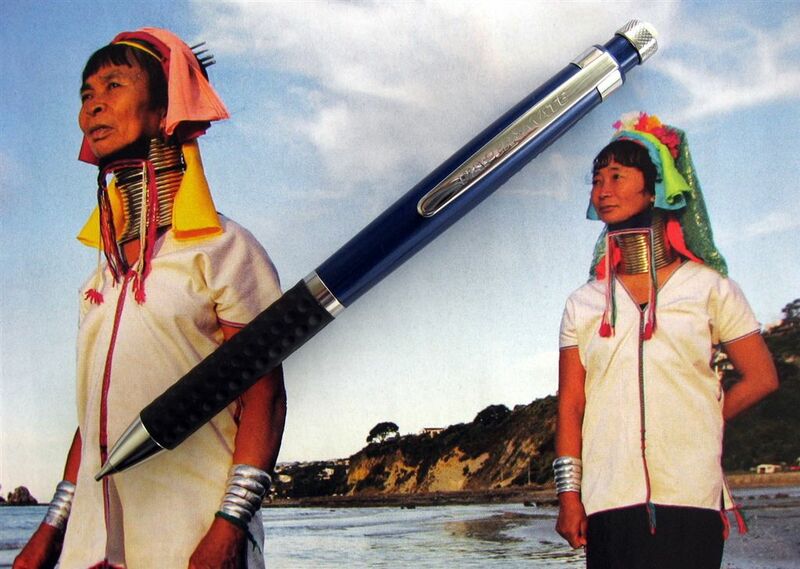 So, when I started thinking about retailers and learning a little more of how they see things, I immediately thought of Cult Pens. Here then is a little Q & A Interview with Simon (the boss) of Cult Pens. Dave - Tell us a little about the history of Cult Pens. Simon - My wife Amanda and I used to work in IT for banks in the City of London – something we didn’t find terribly interesting or fulfilling. We left London in 2001 to ‘downshift’ and ended up buying a small stationery shop in Dartmouth, Devon, where my family live. This was something of an education, neither of us having had exposure to the world of retail, customers, suppliers, etc. before. Comments from customers sparked the idea of a website selling hard-to-find office pens. After a lengthy gestation this finally kicked off in December 2004, and was renamed Cult Pens in May 2005. The idea was that it would only stock the more obscure pens and pencils, but we quickly established that there was demand for almost any pen/pencil, in the way we sold it – which was singly, with good images and details and some product knowledge to back it up. The website quickly matched the shop in terms of turnover, so we sold the shop to concentrate on our online efforts, moving to spacious new premises in Mid-Devon in January 2007. We recruited pigpogm (aka Michael) at the same time, a useful chap with an ideal combination of talents in both PHP and pens. Since then we’ve added a further four staff and will be looking for another as you read this. We’ve grown rapidly but ‘organically’ over the last few years and managing that growth is a constant challenge as any business owner will know. Dave - Do you have some overall philosophy or overriding principle guiding your development? What’s your goal with Cult Pens? It’s no secret that I like my pencil ephemera, but this advert really did catch my eye. From ‘Life’ magazine, 11 June 1971. 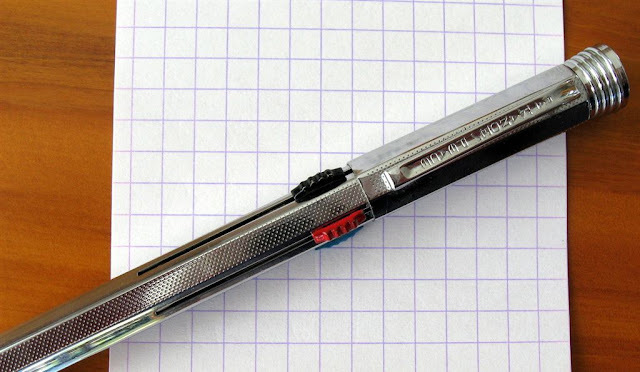 In 1971 ‘modern’ mechanical pencils were starting to come into their own. By modern I mean thin lead (e.g. 0.5mm) and with push top ratchet advance mechanisms – "hand assembled with watchmakers tools", no less! The ad states “Sharp…the world’s finest pencil. The Sharp makes all other pencils seem old fashioned.” Back in 1971 when they said that, there is every chance it wasn’t just advertising fluff, it was pretty much the actual truth.